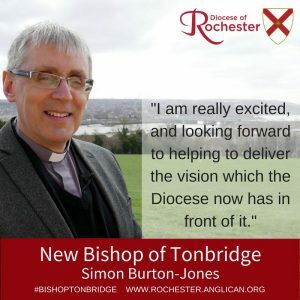 Our Archdeacon, Simon Burton-Jones has been announced as the next Bishop of Tonbridge. We are extremely grateful to Simon for all the support he has given Christ Church. 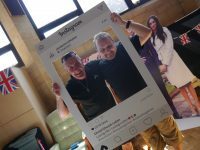 We will be sorry to see him move on from his current role, but are delighted that he will continue to work in and serve the Diocese of Rochester. Please join us in praying for Simon and his family as he prepares for this move. The Bishop of Tonbridge is a Suffragan (sort of an Assistant!) Bishop in the Diocese of Rochester. This role supports the Bishop of Rochester and works with the Archdeacons and others as part of the Diocesan leadership team. As Bishop of Tonbridge, Simon will focus on evangelism and growth. This aspiration and intention to grow is rooted in “Called Together”, the Diocese of Rochester’s vision. 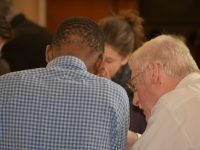 He will also have oversight and leadership of the education, youth and children, and community engagement work of churches across the Diocese of Rochester. In relation to education, he will chair the Diocesan Board of Education, supporting the work of the 89 Church of England schools within the Diocese. More information is available on the Diocesan Website.